Decoration : With this simple IKEA item, she reveals how to add storage space in your bedroom! 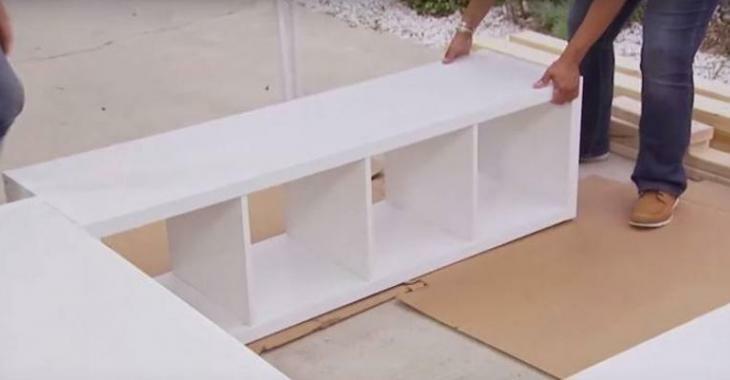 With this simple IKEA item, she reveals how to add storage space in your bedroom! Here's a nice and easy DIY idea for a bed frame! Sometimes you do not have enough space in a bedroom, but with storage cubes or shelves you can make a splendid bed frame. Start by assembling the shelves into a U. Cut three pieces of plywood to the exact measurements of your mattress and place them on the shelves. Then use 2 x 4 'to form the base, between each piece of wood forming the base. Screw. Cut pieces of wood of a length to make feet at the base of your bed, to distribute the weight. Use the drill to fix them. All you have to do is install your mattress, bedding, and nice baskets to place in the shelves to make replacement drawers.